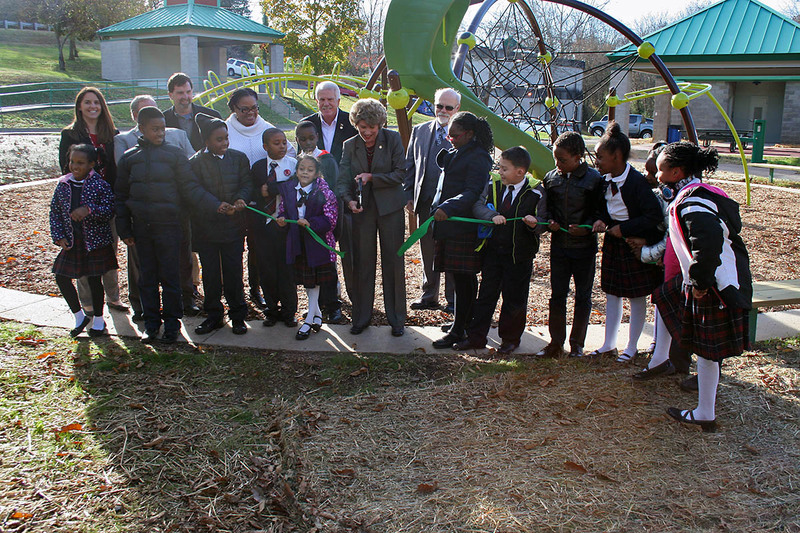 Clarksville, TN – Clarksville’s Valleybrook Park, a neighborhood green space on Crossland Avenue near downtown, reopened Monday after a facelift funded with federal grants secured by the City of Clarksville. Improvements include two new playgrounds, new restrooms, a new pavilion, conversion of the old restrooms to an additional pavilion, and repaving of the parking lot. Clarksville Mayor Kim McMillan, Clarksville Parks and Recreation Director Jennifer Letourneau, members of the Clarksville City Council and students from Tabernacle Christian School cut a ribbon Monday formally reopening Valleybrook Park. Clarksville Mayor Kim McMillan, Clarksville Parks and Recreation Director Jennifer Letourneau and Clarksville Housing and Community Development Director Keith Lampkin conducted the grand reopening ceremony at Valleybrook Park. 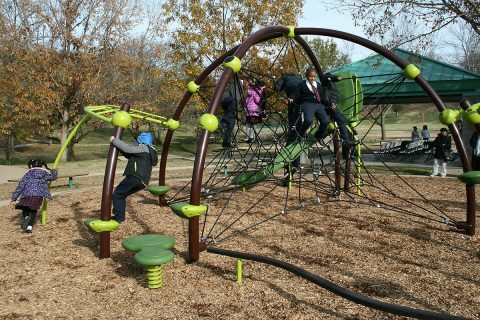 They were joined by a group of students from Tabernacle Christian School, who were eager to try out the new playground equipment. Joining in the event were Steven W. Rawlinson, Deputy Assistant Secretary for Economic Development with the U.S. Department of Housing and Urban Development; Jayni Rasmussen, Outreach Manager for the National Recreation and Park Association; Clarksville City Council members; and a staff member for U.S. Rep. Marsha Blackburn. Tabernacle Christian School students on the new playground equipment at Clarksville’s Valleybrook Park. Money for the project came from disaster relief resources distributed to the City by HUD through its Community Development Block Grant program. Valleybrook qualified for the grants of more than $500,000 because of damage sustained in the Flood of 2010, which reduced the park’s capacity. The project also improved safety in the park by relocating the restrooms. The old restrooms were across the parking lot from the playground area, which forced youngsters to cross the lot to reach them. The new restrooms eliminate that flaw. 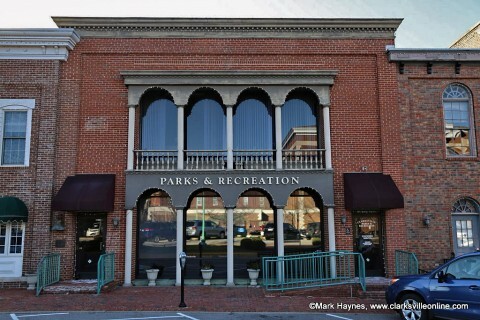 Clarksville Parks and Recreation: Details about Clarksville parks, events and activities are available at www.cityofclarksville.com or call 931.645.7476. Valleybrook Park is at 213 Crossland Avenue, Clarksville Tennessee.